It has an Idling Stop System (ISS), a technology that Honda originated to automatically turns off the engine after three seconds of being stationary and automatically turns on again once the throttle is twisted. This prevents fuel wastage and delivers fuel-efficiency of up to 63 km/liter. 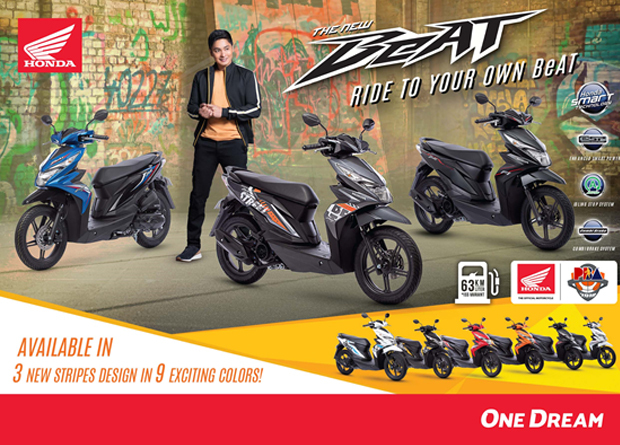 The Honda BeAT comes with Combi-Brake System (CBS) that helps balance the front and rear wheel braking, allowing ease of operation. It also has an Idling Stop System (ISS), a technology that Honda originated to automatically turns off the engine after three seconds of being stationary and automatically turns on again once the throttle is twisted. This prevents fuel wastage and delivers fuel-efficiency of up to 63 km/liter. Equipped with Programmed Fuel Injection or PGM-Fi, a fuel supply system, the Honda BeAT gives engine power with low emission. The scooter also has the following product features: ACG Starter System, CVT (Continuous Variable Transmission with V-Belt), secured Key Shutter, Enhanced Smart Power (eSP), Tubeless Tires, Park Brake Lock, and Side Stand switch. The Honda BeAT is engineered with a wider step floor, 11-liter utility box, and Informative Semi-Digital Meter Panel with Eco-Indicator. In addition, its bigger headlight design is equipped with Automatic Headlight On (AHO) with multi-reflector for wider illumination, and an over-all modern and stylish look.